Electric cars are slowly edging their way into our lives. Hybrids are currently more popular although at the time of writing that means less than 2% of all vehicles sold, so there's a long way to go. What's Happening with Electric Cars? But hybrids, where an electric motor is charged by a conventional motor alongside it, have more flexibility than a pure electric car because they can be filled up at an ordinary filling station. What will happen to our utility charges when we have to start charging our cars at home? Will it be cheaper and more convenient than using charging points anywhere else? The suspicion is that it will. 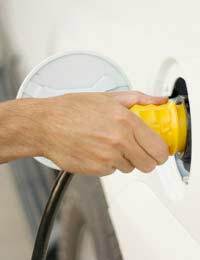 There are numerous networks of charging points being installed for electric vehicles around the UK. But they seem to either be going into large urban centres, where many people don't drive, or there are no details about where they are actually going to be. It almost certainly hasn't been lost on the oil companies that the filling station won't have a role to play in the electric vehicle revolution. Until battery technology improves dramatically, electric vehicles will need at least an hour for a top-up charge and a full charge can take from three hours upward, really only workable overnight or at work during the day. Not many people are going to hang around in a filling petrol station for that long. In fact the supermarkets, who engaged the oil companies in a battle over the pumps around thirty years ago, are likely to be best placed to benefit from the change. If you drive to a large supermarket you are likely to spend forty minutes to an hour there, possibly longer if there's a café. That should be long enough for a significant charge top-up, taking an electric car from two-thirds or three-quarters depleted to full again. But this will really only apply to top-ups and the reality has to be that home charging, overnight, will be the main 'refuelling' method for most electrical car owners. As it's early days no one even knows which of the two main plug formats will be adopted. Fortunately the companies producing home charging points are aware of the complications and most charging points will fit most cars. It would definitely be worth checking compatibility before going ahead and installing a home charging point though. They should also cut out once they detect that a battery is fully charged, to avoid wastage. If you are thinking of taking the plunge the most obvious thing is that you will need to be able to park your car in a garage or on a drive. So it's a no-no for people who have to put up with on-street parking. If you are able to mount the charging point on a wall or in your garage then you don't need planning permission, unless your house is listed. If it has to be mounted on a free-standing post, to get it close enough to the car when it's parked up, then it is classed as permitted development, but only if it is at the side or the rear of the house. If it has to be at the front, then you will need planning permission. The main point is what will happen to utility charges, and here we can't really help as the crystal ball isn’t working. At the moment, night-time electricity is in low demand so it is cheaper (hence storage heaters, which heat up at night on cheap electricity and then discharge heat through the day). Once a significant amount of the UK population starts charging cars at night that's likely to change. A pilot of forty electric BMW Mini cars in Oxford showed a figure of around 2p a mile for fuel costs but once demand goes up, so will electricity prices, it's unlikely to stay that way. Still, it will take time for that change to take place. So for a while at least, if you think you'll be able to live with an electric car, then running one can only be good news for your utility charges.